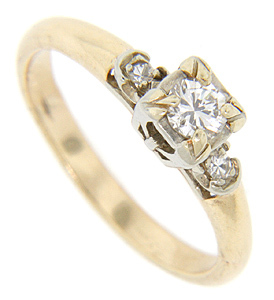 A single diamond is set on each shoulder of this 14K yellow gold antique engagement ring. The central round diamond is set in a white gold square head. The ring measures 5mm in width. Circa: 1930. Size: 4 1/2. We can resize.